ooo nice dirty rat, anticombo! and anti agro. If Dirty Rat and Deathlord had a baby, it would be a mech? That this is a good anti-combo and anti-control (in terms of fatigue) tech, it is and that's undeniable. It will see tons of play just like the aforementionted cards are heavily used in wild. The only thing I am not sure of is whether this is going to create frustrating moments for combo players. I remember some people hating on Dirty Rat, because it was an auto-loss if it targeted the right minion and the same effect kinda occurs here. True, the chances of pulling a cheap cycle minion are really high and you can't do anything, if the enemy's win-condition is in their hand (except with Mojomaster Zihi), but dunno. I can still see some people making posts and complaining about the mech's design. Inb4 since there isn't going to be a hand-disruptive tool, I believe Zihi will continue to see play next expansion. As they promised, a Dirty Rat-style combo disruptor usable by all classes. I like it! The fact that it summons from the deck rather than the hand means there are more cards that are summonable. It also means, on the other hand, that it's more likely to target heavier late-game cards one would normally mulligan. Then on the OTHER other hand, it opens up for the opponent to make a risky mulligan to ensure they don't lose the combo pieces. Exciting stuff! Had to double take to make sure it wasn't summon a copy of a minion. So, it does pull it out like deathlord does. All hail our new combo disruption overlord. That this is a good anti-combo and anti-control (in terms of fatigue) tech, it is and it will be used like the aforementionted cards are heaviliy used. The only thing I don't know if this would create frustrating moments for combo players. I remember some people hating Dirty Rat, because it was a auto-win if it targeted the right minion. Yeah, and it was auto-win for the opponent if it didn't. It sounds kinda fair to me. It's so retarded. I love it. Not as good as Dirty Rat but any type of combo disruption is welcomed in this game. A little worse than Deathlord and unfortunately much much worse than Dirty Rat. But I guess it's better than nothing. Deathlord was cheaper and the downside is a Deathrattle not a Battlecry. Thats why this is not so good as the old lord. On the other Hand, it is a mech and in the past, you can try to manage the outcome of deathrattle of the Deathlord. Now it is pure RNG. 2 expansions too laye, was needed in the boomsday, tech cards need to be released between expansions. Aside from being a combo tech card, this is good by itself. 4 mana 3/8 taunt that can be magnetised by Zilliax is very good. Not as good as Dirty Rat as anti-combo tech because you won't have as much of an idea of when you're likely to hit their combo pieces, as well as being 2 mana more expensive. Not as good as Deathlord for anti-aggro because it costs 1 more mana for only 1 more stat, making it both less above the curve and 1 turn later, as well as summoning the minion immediately. 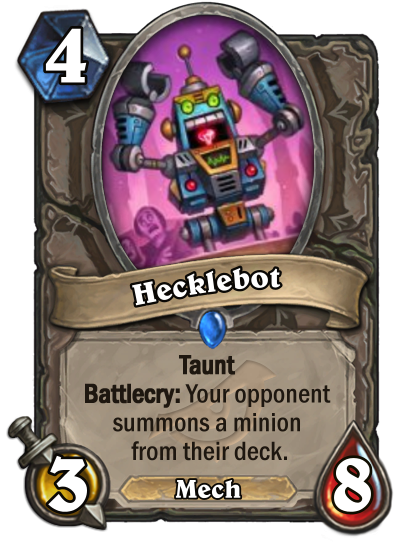 Nonetheless, might still see play in dedicated fatigue style control decks, because it still helps you deplete their deck faster as well as giving you some chance of destroying combo pieces that could otherwise defeat you. Love it. Im back in the game, baby.